This year Britax Römer is celebrating 50 years, thats double my age (well almost). We have worked alongside Britax for a couple of years now and its always a brand I look for when choosing to make a safety purchase such as a car seat. As the brand has been around for a while it's one I trust, they are always advancing with their creations and ensuring they meet the safety standards we expect for our little ones. They are also the choice of the Royals so what could be better? 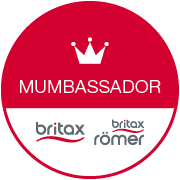 Britax Römer’s heritage is deeply rooted in the automotive industry. In the 1950’s, the brand, formerly known as Britax, was Europe’s leading OEM supplier of in-vehicle safety equipment, such as brakes, seatbelts, vehicle lighting accessories and helmets. Britax Römer built its reputation in post-war Europe, where the need for road vehicle occupant safety came to the forefront of people’s minds, thanks to the use of seatbelts in wartime aircrafts. Britax was one of the first companies to recognise the need for vehicle seatbelts and, by the 1960s, the company was major supplier to leading automotive brands across Europe, including Volkswagen, Opel and Audio, known for its leading-edge quality control and rigorous physical testing. In 1966, the company extended its vehicle safety expertise to children in the car in both the UK and Germany. In the UK, Britax released its first child car seat, the stylish ‘Star Rider’, which featured a five-strap harness and could be used for children aged from 5-11 years old, to protect and restrain them in transit. The product proved so successful that in the 1970s, the Britax and Römer brands made the strategic decision to focus all efforts on child car seats, resulting in a merger early on in the decade, to become Britax Römer in regions such as Germany and France. This rebranding was carried out across the remaining EMEA regions in January 2016 to leverage the strength and heritage of the two strong European brands. Despite the long road that Britax Römer has been on that led to its position as a leader in manufacturing child seats, passenger safety has always remained at the forefront of everything the company does. Britax Römer has applied its unique know-how to developing strong child car seat that work seamlessly with automotive vehicles. The company’s innovative technology, superior research, product-testing capability and long-term partnerships in the motor vehicle and racing industries show an impressive 50 years at the forefront of child safety, as the company continues to push boundaries, so that family life for everyone is boundary free.